Yet cease without its presence. Simply by a matter of perspective. What is it, and who am I? If anyone out there is a fan of riddles like me, this may have been a pretty easy one. I took the liberty of writing a new take on an old riddle that I heard in my youth. If you didn’t get the answer then it’s completely possible I wrote a very bad riddle. Oh, well. It, in this riddle, is light. So what exists in the absence of light, but only if light is also present? A shadow. At the risk of sounding like Bilbo Baggins exchanging riddles in the dark with Gollum (nerdy Hobbit reference), the idea of a shadow is actually a very intriguing concept. Mainly because a shadow isn’t technically anything, neither is it darkness. When something only exists due to the absence of something else (that actually is real, tangible, and measurable) it literally becomes an existential problem. A shadow is nothing more than the absence of photons reflecting off a surface due to a portion of those photons being absorbed or blocked by an opaque object. So if a shadow is just the result of some seemingly intangible process, why is it so ingrained in our minds as a relatively tangible thing? Because our world is always shaped by how we experience it. Before there was a modern scientific explanation, culture had defined a shadow basically as darkness created by shielding light. That is perfectly elegant if you ask me. So in that way, a shadow is a construct of observation, providing validity to a phenomenon. Such things provide intrigue; creators call upon such things to add layers of complexity and emotion to the works they create. A great example is the latest timepiece by Andreas Strehler, which uses the concept of a shadow in a fun and unique way. For your viewing pleasure: the Time Shadow. Strehler used a subtle tone-in-tone color scheme for a majority of the dial: a dark matte grey (which he nicknamed blackor) across the dial expanse, while the hour ring is a darker brushed and coated black. The name Andreas Strehler appears on the dial in a similar black, ensuring a subdued presence. The general feel of the watch sits comfortably in the “dark” category. Offsetting the “dark,” the minute indications are a mix between polished steel domes (and a single triangle) and orange Super-LumiNova, the minute hand is polished steel with Super-LumiNova added, and the hour indication is a large orange Super-LumiNova circle nestled behind the hour ring at 12 o’clock, highlighting the current hour of the regulator-style display. And this is where the concept of the shadow comes into play. The dark hour ring, while slightly contrasting with the dark matte grey dial, fades into the background. When a numeral on the ring passes in front of the bright orange circle, it appears as if a shadow is moving across a bright field. This literally casts a shadow when it is viewed at night as the Super-LumiNova glows and the ring’s numerals shield the wearer from the emanating light, creating an area of shadow in the shape of numerals. When the minute hand is at the top of the hour, the corresponding hour numeral is positioned directly in the middle of the miniature sun (a bright orange glowing ball, what else could it be?). As time passes, the numeral slowly moves out of the bright orange circle and the next number creeps in. By 30 minutes past the hour, both the last and the next number are somewhat visible at the edges of the circle. By 35 minutes past the hour, as the hour numerals continue their march, the minute hand reaches the end of one portion of its journey. The minute indications seem to be split into two semicircular rings since the hour dial overlaps (I’ll discuss that a bit more later); the main minute markers only go from 55 minutes around to 35 minutes. The rest of the minutes are indicated by the tail of the minute hand, a small pointer that meets a scale that, in reverse, displaying minutes 28 up through 2 minutes past the hour. This way, there is always an end of the hand indicating the more precise time, and for a few minutes at each half of the hour it double indicates. The minute hand isn’t just a minute hand, though; it is also a driving pinion for the hour ring because it is simultaneously an hour wheel. The exterior of the ring is toothed and meshes with a pinion mounted to the minute arbor holding the minute hand. If you examine the dial close up, you can just make out the tips of the pinion teeth peeking out from under the hand. This means that the hour ring is a dial-side movement component while the rest of the movement is tucked away from view. That movement is 100 percent typical Andreas Strehler, even though it does away with the characteristic “papillon” bridge layout. The “papillon,” which means “butterfly” in French, is a Strehler staple that has made it into almost every watch bearing his name. Here, though, this decorative element has been replaced with a clean three-quarter plate (Strehler calls it 5/8 plate) with grainage finishing. This is in an effort to stick with the modernistic, non-flourished design of the watch while also drawing attention to a couple of key elements. First is the conical winding gear appearing in a small cutout on the crown side of the movement. Strehler goes to great efforts to produce smoothly operating winding and time-setting mechanisms since that is the main physical connection to the movement from the outside world. The conical gears mesh more accurately and smoothly than simple square gears mated at 90 degrees, providing a much better transfer of force. Not seen in the small cutout is the conical time-setting pinion, which makes for a very smooth feel when the wearer sets the time. Also not visible is Strehler’s improved clutch/set lever for the sliding time-setting pinion, which utilizes a forked tip for the lever that eliminates any possible issues with the mechanism jamming. 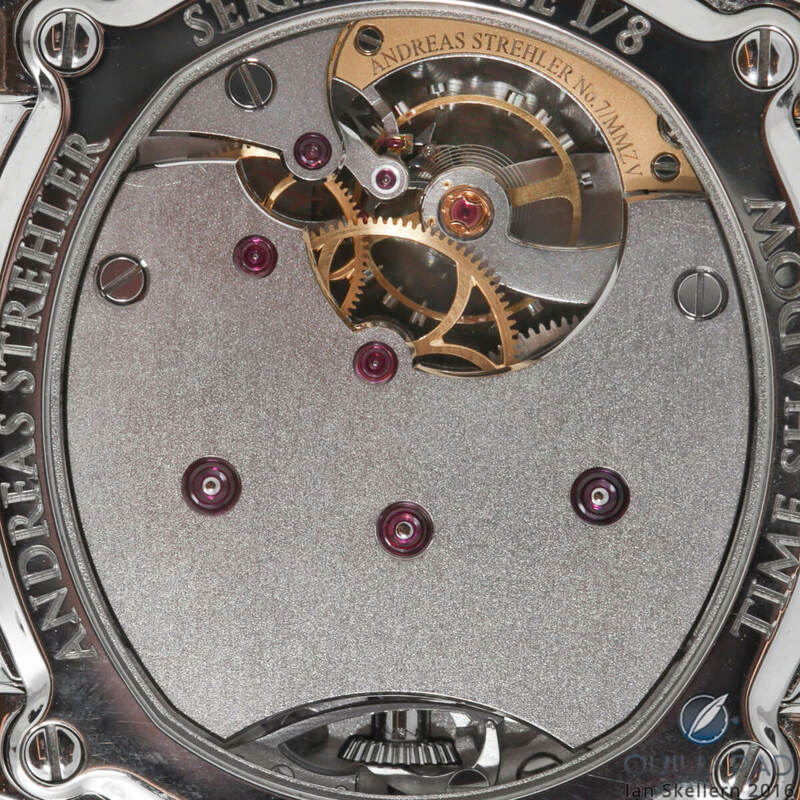 On the opposite side of the clean expanse of the main plate is an opening showcasing Strehler’s balance and escapement as well as the large hand-beveled third wheel and minute wheel. This is to let you know that all the expertise Strehler brings to the table with hand-finishing techniques is all still present even if the watch is geared toward a more modernistic taste. Also not visible, but still present, is the awesome differential stop works designed by Strehler that guarantees a more consistent delivery of power and an exact power reserve period of 78 hours. All Strehler calibers feature this stop work, which centers around a continuously moving pinion gear attached to the barrel arbor. This pinion rides inside an internal ring gear that is itself riding in an eccentric cutout in the barrel. The pinion features one extended tooth as a locking function that prevents the complete winding and unwinding of the mainspring. The internal ring gear has spaces that allow the extended tooth to pass, but an odd/even ratio to the pinion and ring gear means that eventually the extended tooth will hit a normal tooth on the ring gear and prevent it from meshing further. This allows the fine tuning of the winding and unwinding based on the initial assembly positions of the differential stop works. This is a pretty radical feature that is not even touted much in the official watch description – and as such is a hidden gem for the truly passionate. Combining that with the double mainspring barrels provides the movement with strong, consistent power delivery, which reduces wear on the pivot of the central wheel due to even pressure from almost opposite sides on the wheel. It is details like this that highlight Strehler’s skill as a movement designer. This awesomeness even extends back to the dial side details that I spoke of earlier; the subtle driving pinion beneath the minute hand, the double minute indications ensuring legibility, and a layout entirely new to the Andreas Strehler collection. Strehler’s Papillon logo is placed squarely in the center of the hour wheel, black polished and set against a matte black surface so that only in the right light will it be seen. Photos fail to do justice to this feature as the black polishing fades into the background until it catches just the right light. It also can pick up other colors, including the orange on the dial, giving it a subtle hue change and expanding the visual experience of the logo. The Time Shadow is limited to just eight pieces, matching the overlapping dials that create an infinity symbol figure eight. This is a rather normal layout in the watch industry; round shapes will always easily give way to a figure-eight, not to mention its importance to Eastern markets, but the subtlety of the layout speaks volumes to the intentions of Strehler. The time is indicated in a way not dependent on the figure-eight layout, intimating that the layout is not as important as the feeling the watch gives you. Strehler’s tendency of quietly improving upon parts of the movement – like the conical gears, clutch/set lever, and the differential stop works – puts his dedication to making the best watch he can right on display. This is why his other movements feature rather rare elements such as the remontoir d’égalité (see Blood Moons, Lunar Tetrads, And The Andreas Strehler Sauterelle à Lune Perpétuelle), a moon phase mechanism accurate to more than two million years (see The 8 Most Accurate Moon Phase Wristwatches Today), and a moon age indicator based on a Vernier scale that provides the age of the moon to within three hours’ accuracy (see Objects Of Desire: Independent Watches At Baselworld 2016). Andreas Strehler is a watchmaker that puts his heart and soul into his watches and lets them speak for themselves. Knowing the man behind the watches and having discussed watchmaking with him at length, his watches will always stand out to me. The Time Shadow is the latest iteration of his creativity and straightforward nature. It is a natural progression from his other pieces, even if it seems wholly different in feeling. Given that it is also the most affordable (in haute horology terms) of his watches, this means Andreas Strehler will also be on the lips of more aficionados of fine independent watchmaking. And that is a great thing. Like the ghost of a shadow passing across an empty moor, I exit, leaving behind thoughts and memories. And my breakdown! Wowza Factor * 9.0 A surprise release from Strehler to be sure, the Time Shadow needs to be more than just a shadow in my life! Late Night Lust Appeal * 88.7 » 869.849 m/s2 Lusting of this piece might be different than Strehler’s other pieces, but only because it’s a shadow in the night! M.G.R. * 69.5 An Andreas Strehler movement is definitely geek-worthy with the differential stop works, conical gears, and incredible finishing. Added-Functionitis * N/A Unlike many of Andreas Strehler’s pieces, this watch actually doesn’t feature any added functions so you can skip the Gotta-HAVE-That cream, though it doesn’t change how much I really gotta have it. Ouch Outline * 10.9 Grabbing the wrong end of a soldering iron! When using an older soldering iron, the lack of insulation becomes quickly apparent the moment your concentration moves somewhere else. But I’d do it again to get this watch around my wrist! Mermaid Moment * One Hour. If you only watch the Time Shadow for an hour it will be enough time to see the shadows of time creep across its face. The next hour can be spent setting a date for the ceremony. Awesome Total * 792 Multiply the number of components in the movement (132) with the number of watches in the edition (8), finally multiplied by the percentage of the movement that is covered by the main plate (3/4 or .75) for a shadowy awesome total! For more information, please visit http://astrehler.ch/time-shadow.